Many organizations who serve families and communities do excellent work toward providing resources to create happy, healthy, and propserous families. But unfortunately, many fail to intentionally include fathers in the work they are doing. In 2013, do it for the children. Involve Dads in your work! If you are an organization who is already focusing on fathers - great! 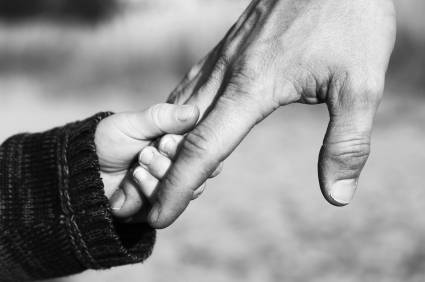 We have 5 things to ensure your fatherhood program thrives. 1. Assess Your Father-Friendliness. When fathers come to your organization, do they only see images of mothers? Are there any male staff members in your organization? Your father involvement efforts won't be successful unless fathers feel comfortable. A simple way to help fathers feel more welcome is to use posters or a Fatherhood Kiosk in your lobby or waiting area. Not sure how father-friendly your organization is? Take our FREE Father-Friendly Check-Up™ for a customized evaluation and helpful recommendations. Get started by clicking the button at the end of this blog post. 2. Focus Your Efforts. This is one of the most important steps in preparing to serve fathers, and therefore, the longest in this post. What kind of fathers do I want to engage? Think about the fathers that may come to your organization, the types of families you serve, or the kind of fathers you're looking to serve. What are these fathers' interest points, and what barriers may they have for father involvement? The answers to these questions will inform what kind of resources you use, and how you structure and market your programs. How much time and budget does my staff/organization have to dedicate to fatherhood programming? Considering this aspect will help you hone-in on the types of resources that will best fit your organization. NFI categorizes fatherhood programming into Low, Medium or High Intensity levels, based on the amount of staff time and budget you have to invest in serving fathers. Choose the level that best fits your commitment in 2013. 3. Partner with Other Organizations. Be creative and look for a variety of non-profit and for-profit partners that will help you increase your reach and provide valuable resources that you may not have on your own. You can use partners to create a referral network - have other organizations who aren't prepared to work with fathers refer them to you. Or, for-profit partners may be able to fund your efforts or help with promotion. 4. Think About Sustainability. Funding is a key part of any father involvement program. Many organizations sustain their efforts through local, state, and federal grants. Click here for a recording of our Financial Sustainability Webinar and get ideas for program sustainability. 5. Start with a Kick-Off Event. Ready to get started? Hold a community-wide event to create exposure and excitement! Whether it is a family fun day, father-child activities, or a basketball tournament, an event will help you expand your reach and create excitement for your upcoming programs and efforts. Consider handing out fatherhood skill building materials like brochures or 24/7 Dad® magnets. Use one of our Fatherhood Kiosks to make free fatherhood resources available to dads you serve!